So....I was watching Chopped tonight. On the one hand, I love this show. It's quick, you're watching pro chefs sweat it out under crazy conditions and expectations, you have the fabulously bitchy Alex Guarnaschelli expressing profound displeasure with pretty much every dish. On the other hand, a lot of the food doesn't really look that great. I hate watching people labour under unreasonable time constraints and ending up not finishing something by a matter of mere seconds. It's sad. And totally ridiculous. BUT, the reality is that most of us have a lot of constraints when it comes to our cooking. We have budget constraints (what? you mean I can't have tenderloin every night? dammit. ), availability constraints (avocados in Ottawa are almost invariably rock hard), but most importantly, most of us have TIME constraints. I can't even COUNT the number of times I've had the greatest intentions of making a fabulous meal, only to end up fixing a cold plate, ordering in, or just noshing on whatever I can scrounge up. When you're working, commuting, and basically just trying to live (whether you have kids, a partner, pets, activities), sometimes it's just freaking hard to cook. So this is something that you can make REALLY quick. Perfect for a night when you want a little bit of fabulous, but are short on time. The ingredients are simple, prep is dead easy, and it's pretty hard to screw up. 1. When you get home, start the rice with the coconut extract. Yes, you could use coconut milk to cook the rice, but I personally find it makes for a very heavy dish. Plus, I have a dress that doesn't zip that I NEED to wear in 10 days. No coconut milk here. I use a rice cooker for my rice. You should too. 2. While the rice is cooking, heat two large pans on the stove (both medium-high heat). 3. 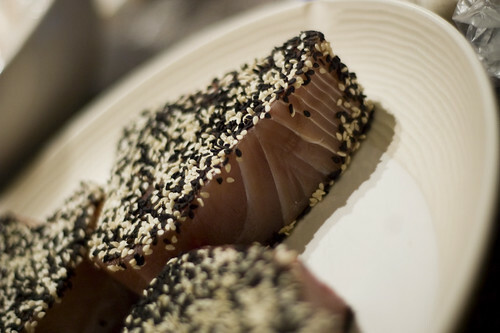 Mix your sesame seeds on a plate. Season the tuna with salt and pepper. 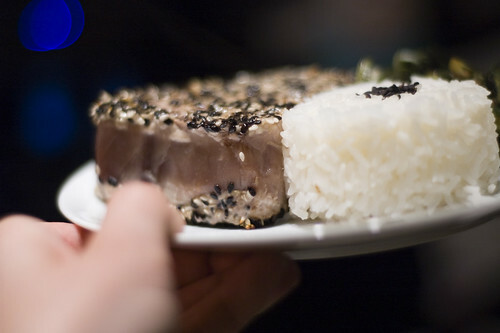 Press the tuna (both sides) into the sesame seeds. It should look pretty cool. 4. Add the tuna to one of your pans (along with sesame oil). It should cook about 4-5 minutes on each side. At the end, it will be rarish. This is okay (as long as your tuna is fresh). Don't overcook it or it will become like canned tuna (i.e., way too dry to actually be enjoyable like this). Rare tuna is a very very distant relative of its canned and processed brethren. Don't kill it. 5. 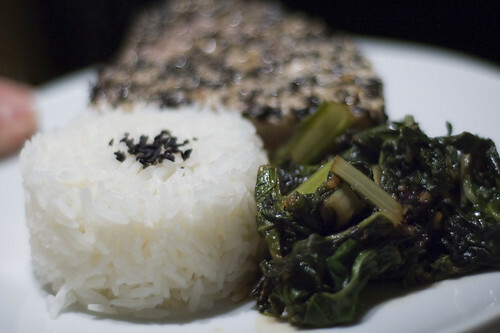 While tuna is cooking, prep the garlic, ginger and greens. Add the sesame oil to the pan, then add the garlic and ginger and stir-fry briefly. Add your chopped greens and stir-fry until wilted. Then add the soy sauce. This looks delish. Where do you buy your frozen tuna? I've never found good frozen ones (raw). And going to the fish shop for fresh would break my bank. I've been following your blog for close to two years now. Never commented before this. love your blog and the way you write. Thanks for sharing all these wonderful recipes. I love your recipes. Thanks for another awesome meal! Wow, this looks great! And I love using frozen fish so I will have to try this one. I'm an advocate to your cause! Quick meals are definitely nothing to be scoffed at.